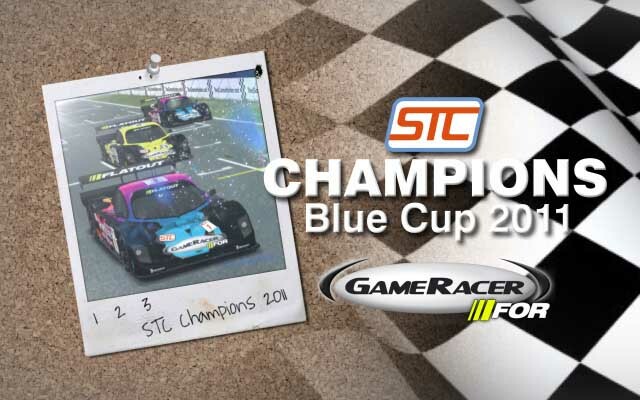 Gameracer FlatOut Racing won their second straight STC championship after dominating the last round of the Blue Cup at the demanding Spa-Francorchamps. Eau Rouge took many victims in a race that Roaring Pipes Maniacs rather wants to forget. FlatOut took pole with Mike Simian and Kevin Clark started in 5rd with their sister team driver Ben Tusting in 2nd. Best RPM driver was down in 6th in the hands of Hannu Karesola and teammate Marcin Skrzypczak back in 8th. So already from the get go RPM had a tough race ahead of them. Simian took off and was followed by his teammates throughout the whole race and was never in any danger. They finished the race á la Le Mans style. It was behind them that the action happened and Eua Rouge was a major player in most of it. Halfway through the race Skrzypczak ended the little title hope that RPM had left when he hit the wall in the infamous corner. He got back on track though but was far behind with a damaged car. He was not the only one though to crash there. Both FDR drivers of the day had big offs there and the pass of the season was also made there by FCR's Kelvin van der Linde. He, however, suffered a minidump later on. Corse Online made a brilliant qualifying and mixed it with the big guns with Marco Giuliato in 3rd and Luca Dafarra in 4th. They stared off well but the latter had an incident in the pit entry that ended his race and Giuliato blew his engine when in 4th. Karesola finished 4th in the end, some distance behind the FlatOut drivers. Tyler Scurlock in the second FCR Doran made possibly the drive of the race coming from the back of the grid up to 5th, pulling off some memorible moves. One of them on Daniel Beck who finished 6th for Gubbklubben. Ben Buitendikj finished 7th on a one stopper for The Black Rebels. Bosse Jonasson in the second Gubbklubben car finished behind him in 8th. Skrzypczak managed to climb his way up to 9th in a last corner move on TBR's Mikael Hellén who was suffering from engine problems. Hellén then spun trying to defend and also lost 10th to Torrent Motorsports Reggie Blain. Le Mans looked to be a real treat as the two teams fighting for overall victory, Roaring Pipes Maniacs and GameRacer FOR, were only seperated by 4 points going into the race. Things then changed to the worse for leaders RPM as they got demoted to the back of the grid as they never allocated which drivers they were going to race with. When finally the race began FOR were on it right away in the wet conditions with Mikko Korkiakoski taking a big lead with teammate Risto Kappet passing both Gubbklubben cars to settle in to 2nd. RPM drivers Rami Kaukola and Hannu Karesola charged through the feild and was in 3rd and 4th after only a few laps. And just when the pitstops were about to come into play four drivers dropped out of the server without any warning. Race direction was on it immediatly and after some discussion the race was red flagged after only 7 laps and it was decided to give half points. That means GameRacer FOR gets a 1-2 finish ahead of the two RPM drivers. Another pair of teammates, Göran and Robin Johansson of Gubbklubben, were 5th and 6th. The Black Rebel driver Harald Stadler got 7th ahead of Corse Onlines Antonio Cambria, Flying Dutchman Racings Jakob de Boer and Torrent Motorsports Reggie Blain. Mike Simian took another win for his Gameracer FlatOut Racing at Donington Park as the Blue Cup gets closer and closer to its final. Simian, who have won here twice previuosly in STC, showed that despite the weather playing him and his fellow competitiors a few pranks he was unbeatable, winning by over 15 seconds. His teammate Mikko Korkiakoski finished 3rd which meant that FOR gained on RPM at the top of the standings. Sandwitched between the two FOR cars finished Peter Duivelaar of RPM. It was much closer between 4th, 5th and 6th place. Last race winner Ben Tusting made another great run for the FOC team. He finished two seconds ahead of Corse Online's Marco Giuliato. He was then only 4 seconds ahead of the second RPM driver of the day, Marcin Skrzypczak. It was even closer between FDR and its sister team FCR for 7th and 8th as Yuri Braham beat Tyler Scurlock by only .060 of a second. Fortunato Fiorito made the day even better for Corse Online as he crossed the line in 9th bringing their second car inside the top 10 aswell, marking their best race this season. Finishing off top 10 did Bosse Jonasson for Gubbklubben.